But here I am this afternoon, bloggie friends, prioritizing YOU. This is the view from the doorway. I took this pic during the Christmas season, so there are a few added holiday touches. Sorry if you're soooo over that. I'm not. And my confession is that the paper snowflakes are still hanging from the ceiling. The colors were meant to be gender neutral, as we got started on the room before we had our referral. The grey on the walls was a Farrow & Ball (cha-CHING) color that I saw in Real Simple magazine. I went to my local Benjamin Moore store, which had a color swatch of Farrow & Ball. They color matched to Benjamin paints for me. Then I took the samples to Home Depot and got them to color match some generic and MUCH cheaper paint. Shout-out to my hubby Nick, who REPLACED the baseboards and painted them--a little detail that made the room feel so much nicer. The curtains are homemade from a cheap white fabric Target shower curtain. I split them in half, sewed up the hems, and sewed on a border from fabric I was already using in the nursery. They are hung with...what else? Shower curtain rings. :) The curtains are shorter than I'd like, but beggars can't be choosers, and neither can people on a budget sometimes. The tiny Xmas tree and end table were temporary for the holidays--I had to find a spot for the end table, actually, because it was displaced by the Xmas tree in our living room. A lot of things in Rhet's room are like that--"there" because that's where they fit. 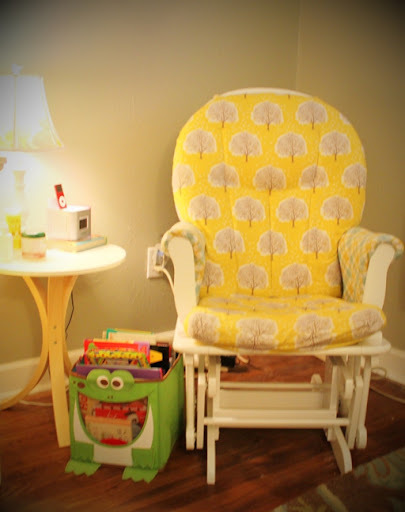 The cream colored Ikea chair is another example. We have no other spot in our house for it, and it ended up being nice for when Nick and I are both hanging in the nursery. 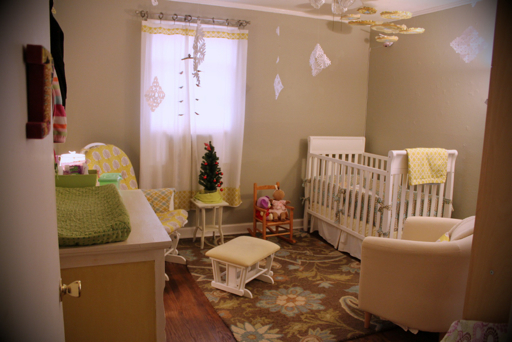 I'll talk about the crib and bookcases (on the wall you can't see in this picture) on another day. We also made some "big girl" changes after the holidays, and I have finally finished some art projects for the walls, and I'll save those for a later post as well. The knobs are a happy splurge from Anthro, and they're also a bit sentimental. My friend moved to Memphis to open our Anthropologie here, and I temped for two weeks to help get the store up and running. It was a super interesting and super exhausting experience. And I made a little cashola with a temporary employee discount...voila. Dresser knobs. 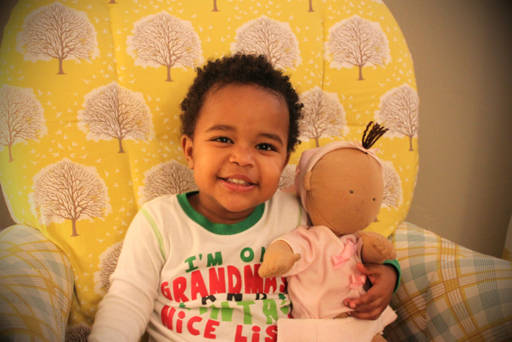 When I first started looking at bedding for the nursery, I was in love with the Land of Nod. (A continuation of my Crate & Barrel love from wedding registry days, I guess.) While I ended up going a less expensive route on the bedding, I allowed myself the changing pad cover. 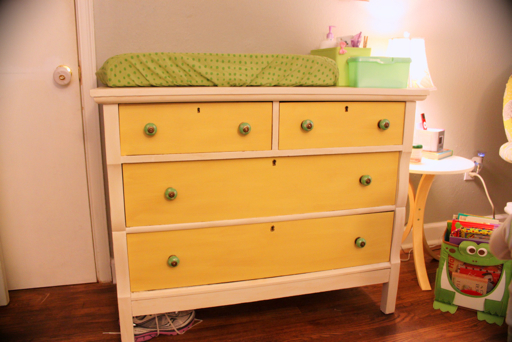 :) We keep Rhet's cloth diapers, disposable diapers, and clothes in this dresser. Again, the Land of Nod had my ultimate nursery dream item: the upholstered glider. I really wanted a piece of furniture that I could use elsewhere when it's nursery time was up. But I could NOT justify it in the budget. Instead, we purchased this super cheap wooden glider from Target. The cushions were the color of the ottoman (in the doorway pic)--still need to cover that ottoman! I painstakingly created covers for the cushions out of two different fabrics. And it was true pain--those cushions were thick and running the needle through them made me hate my life. But it was worth it, because I ended up with something I loved even though it didn't start as such. The end table was another Ikea purchase that was displaced from another room. I can't wait to show you the lamp...another time! This little munchkin has awoken from her slumber. Time to get our "zoo" on! Wow!! Stunning.. like something out of a magazine! Love it!